Tumalog falls on Cebu Island is one of the most beautiful waterfalls in the Philippines. The turquoise waters of the falls aren’t quite as vibrant as at Kawasan falls, but the sheer size of the waterfall makes it an incredible place to visit. 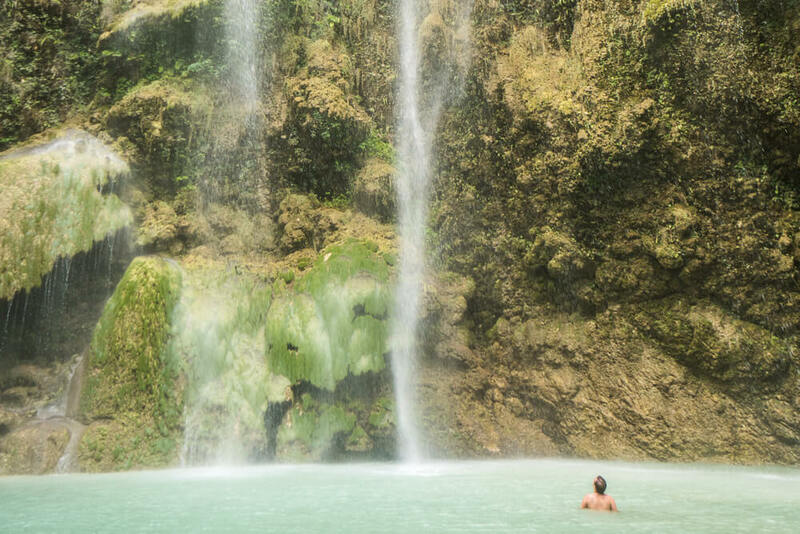 Due to the somewhat remote location of Tumalog falls in South Cebu it was only discovered in 2012, but thankfully the waterfall is now easily accessible by road. It’s a great place to adventure to as part of a day trip discovering the amazing waterfalls of South Cebu. Two of the other waterfalls worth visiting on the island are Aguinid falls and Kawasan falls. Find out everything you need to know about visiting Tumalog falls with this guide! Tumalog falls entrance fee – 20 pesos per person. Tumalog falls height – 80-100 metres (approximate guess). Tumalog falls is quite near Oslob – a popular spot in Cebu for whale shark watching. The easiest way to get to the falls from Oslob is by renting a bike/scooter, which should cost around 200-300 pesos per day. Be careful if you do opt to rent a bike as your travel insurance won’t cover you if you don’t have a valid license and get into an accident! Alternatively, you can take a habal habal (mototaxi), which should cost around 100 pesos per person one way. If you plan on doing a day trip and want to go from Tumalog falls to Kawasan falls then we recommend renting a bike/scooter yourself. That way it’s a lot cheaper than paying for transport between the two as they are a few hours drive away from each other! If you want to visit from Cebu City, take a bus to Bato and tell the driver you want to get off at Tumalog falls. The bus should cost 150 pesos and will drop you off at the turning to the falls from the main road. From here you’ll need to take a habal habal up to the car park before making your way to the falls. You can also arrange a private van to take you, which works out as good value if you’re travelling in a group. We recommend asking around in Cebu City and looking online to get the best price. Generally you’ll end up with a better deal by arranging a private van/driver than if you travel by taxi. Although it’s possible to visit Tumalog falls from Cebu City, it’s much easier to do it from nearby. We recommend staying in the south of the island and visiting from there. Once you’ve reached the Tumalog falls car park, you have to descend a very steep road to get to the waterfall. It takes around 10 minutes to walk down or you can take a habal habal down for 30 pesos one way, or 50 pesos return. The entrance booth to the falls is at the bottom of the road, and from there it’s a short walk to the base of the waterfalls where you can go for a swim and get brilliant views! As Tumalog falls is close to Oslob, it’s best to arrive early if you want to avoid the crowds. We visited in the afternoon, which meant it was harder to get pictures without anyone in! 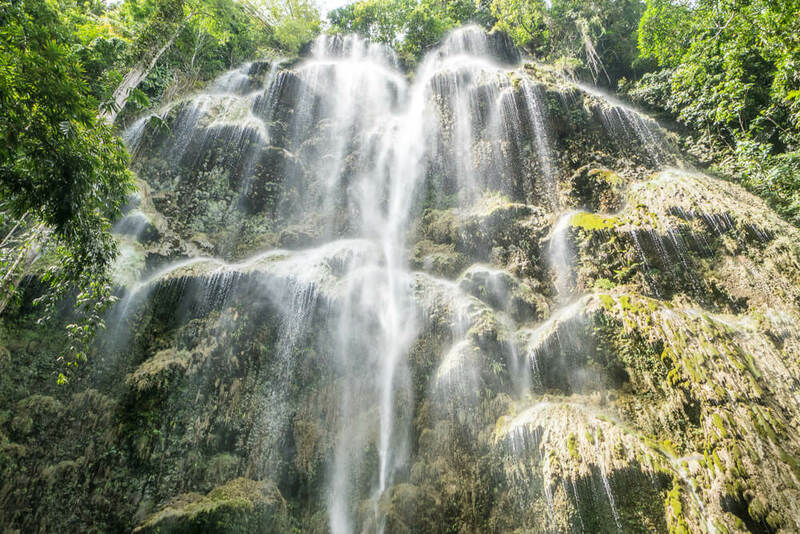 In terms of weather, the best time to visit Tumalog falls is between December and June, which is the dry season on Cebu Island. The rainy season on Cebu runs from late June to early December, so the falls will be more powerful if you do visit at this time. Water depth – The water at Tumalog falls isn’t too deep, so even if you aren’t a confident swimmer you should be able to get in as long as you can touch the floor! Water temperature – One of the things worth knowing before you go is that the water is relatively cold. As it’s generally pretty hot in the Philippines it’s actually a great way to cool off so it shouldn’t be an issue! Take a habal habal back up – If you want to save yourself from working up a sweat on the way back to the car park, we recommend taking a habal habal. It should cost just 30 pesos per person and saves the steep walk up. As the road is very steep it can be a bit scary, but the drivers are used to the road so we were convinced that it was safe enough! Mini viewpoint – There is a small mound beside the falls which gives a different perspective and is good for getting some pictures. When we were there it was very muddy and slippery due to the water spray, so be careful if you decide to go up! 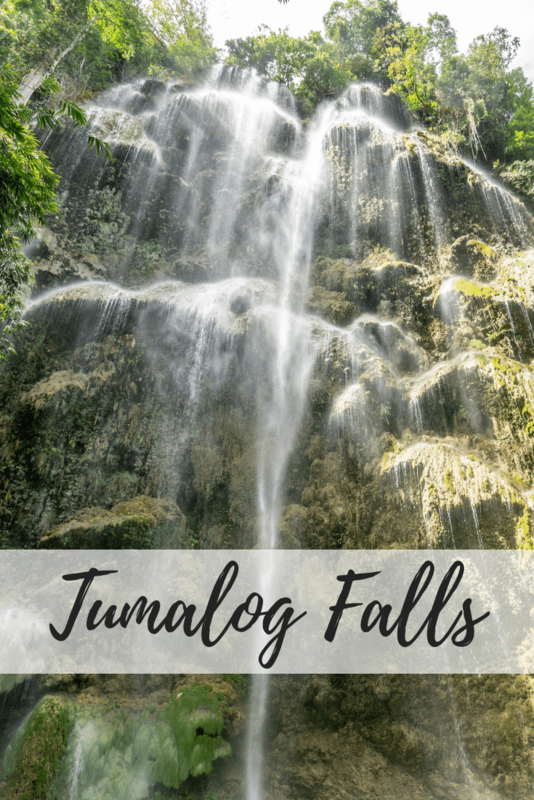 Like this guide to Tumalog falls? Pin it!